Come fish with the Captain and Crew aboard C-DEVIL II or Lil' Devil II. 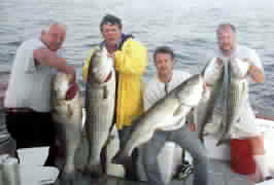 We are Full time fisherman with more than 40 years of combined experience fishing Rhode Island waters. Bring your family, friends or business associates for a memorable day of fishing. 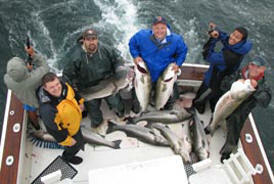 We offer a variety of charters for 1-6 passengers. C-DEVIL II, our 32' Topaz Sportfisherman, is the ultimate in stability, comfort and fishing. With twin 320 HP CAT turbo diesels to propel you along at 24 knots to your fishing destination, this means more time for fishing and less time traveling. When on the fishing grounds we are fully stocked to take advantage of every situation, from Big Game to light tackle. We can do it all. You can be sure everything will be ship shape for your fishing adventure. All bait and tackle is provided.